The National Aquarium Denmark – Den Blå Planet is a commercial foundation for the purpose of disseminating knowledge about aquatic life in a global context to a wide audience. The aquarium must also make a significant contribution to education and make animals and facilities available for research purposes. 1.1. Our animal population must be enrolled in international breeding programmes and breeding partnerships to the extent they exist, thereby contributing to the conservation of the diversity of animal species. 1.2. We will make a targeted effort to breed several of our fish species. This will make us as self-sufficient as possible and limit to the greatest possible extent the collection of animals from nature. 1.3. The procuring of animals, including animals captured in the wild, will always take place in strict accordance with all applicable laws and regulations. 1.4. Animals may only be transferred to approved zoological facilities within Denmark and abroad or to private individuals or organisation if the transfer is part of a breeding partnership. 1.5. Any culling of surplus animals that cannot be transferred elsewhere and any euthanasia of animals due to illness must take place in accordance with the American Veterinary Medical Association Guidelines for the Euthanasia of Animals. 1.6. All employees who work with our animals must be professionally trained or able to document possession of the necessary knowledge and skills. 2.1. Dissemination efforts at the National Aquarium Denmark – Den Blå Planet and on the aquarium’s digital platforms must be of a high academic calibre with content based on science and presented in an easily accessible and engaging manner. 2.2. Through graphics and text, the animals on exhibition must be described in a manner that ensures correct identification and presents to a reasonable degree selected aspects of the animals’ biology and distribution. 2.3. Teaching conducted by our school activities department (Skoletjenesten) utilises scientific working methods and focuses on developing the pupils’ concepts and understanding. All teaching will be about the animals and their interaction with humans and the environment. Living animals will always be incorporated into our teaching efforts. 2.4. Skoletjenesten employees must have an appropriate education with scientific and didactic insights. 2.5. The National Aquarium Denmark – Den Blå Planet will supply animated communication and dissemination by storytellers who strive to set the hearts of children and adults beating for the wonderful world of aquatic life through programmed storytelling, shows, activities and, not least, personal interaction. 2.6. This approach seeks to ensure that the core production is coupled to personal storytelling, which is assessed to have a stronger and more long-lasting effect. 2.7. The animal population must be presented to the public in such a way as to increase their interest in and understanding of nature. In this strategy, the National Aquarium Denmark – Den Blå Planet is committed to including storytelling about threatened aquatic species and habitats in an engaging, adventurous and action-oriented manner that underpins the National Aquarium Denmark – Den Blå Planet’s image as a world-class organisation and nature ambassador. 2.8 The animals used by Skoletjenesten and in the petting pools are selected in collaboration with the animal department. The animal department is responsible for rotating the animals in the petting pools so the ambassador role never becomes a permanent job for the animals. 2.9 The animals must be treated gently, always kept underwater and in accordance with their hardiness. For example, a crab may be held, but a fish may not. 3.1. The National Aquarium Denmark – Den Blå Planet does not wish simply to be a passive consumer of knowledge, but will be actively involved in expanding knowledge through a range of research activities. 3.2. We collaborate with researchers, institutions and NGOs from Denmark and abroad. The National Aquarium Denmark – Den Blå Planet participates in such projects in a variety of ways, for instance by providing access to our facilities, animals and staff. 3.3. 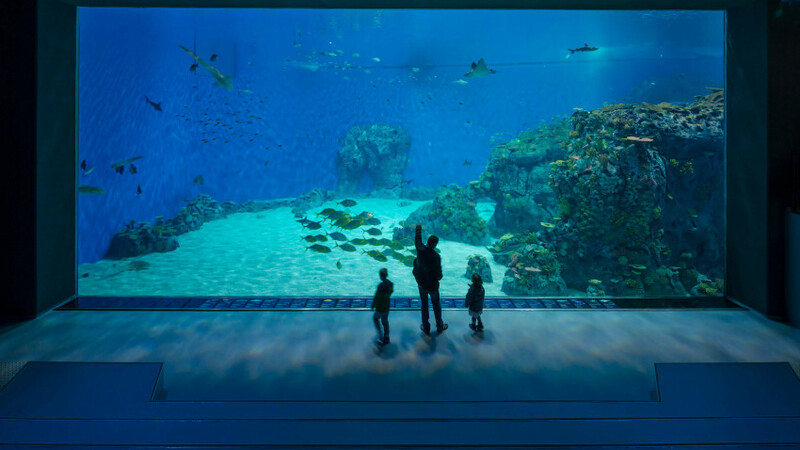 The National Aquarium Denmark – Den Blå Planet conducts fundraising among the business community and guests for selected nature conservation and research projects as a way to actively promote conservation efforts for aquatic life. 4.1. As a nature ambassador, efforts targeting the environment are a natural part of the National Aquarium Denmark – Den Blå Planet’s activities and we will continuously work to minimise our resource consumption, including limiting our emissions to the greatest possible extent while taking into consideration animal and human welfare. 4.2. Through dissemination and education, we will seek to influence the environmental behaviour of our staff, guests and partners. We will also seek an open and positive dialogue with the public regarding the results of our environmental efforts. 4.3. Through environmental certification in accordance with ISO 14001, the National Aquarium Denmark – Den Blå Planet has an obligation to focus on minimising resource consumption and contributing to sustainability. 4.4. The National Aquarium Denmark – Den Blå Planet maintains carbon-neutral electricity consumption by investing in Renewable Energy Credits (RECs) for onshore wind power. 4.5. We utilise the resources around us, for instance by collecting rainwater and piping in water from the Øresund for use in the aquariums and for cooling. We also minimise the waste water load by purifying and releasing water from our processes back into the Øresund.